As Carolyn Passerelli pointed out in this week’s letters, no bike lanes are going to be installed in the narrowing of Lansdowne Avenue between Bloor Street and College Avenue. I double-checked this with Adam Giambrone’s office last week, and found that, yes, I was indeed wrong when I reported that bike lanes would come with the road reconstruction. So where did I get the idea that this was part of the plan? Every time the councillor mentioned the cycling component in the reconstruction of Lansdowne during our interview, I assumed he was referring to bike lanes, when in fact he was talking about sharrows, a type of cycling infrastructure that I’d never heard of before. [Note to self: keep up on I Bike T.O. blog.] That Giambrone actually mentioned bike lanes during our discussion of Lansdowne might have caused me to jump to conclusions as well. The opportunity that would have been lost, I now know, was the installation of sharrows. For those as out of the loop as I am, sharrows are bike symbols painted on streets that are not quite wide enough for bike lanes. They remind drivers that cyclists are part of the road and indicate the part of the road where cyclists can most safely travel. (â€œShareâ€ + â€œarrowsâ€ = â€œsharrowsâ€). Sharrows are also a relatively new thing — Vancouver has them on some of its streets, but Toronto doesn’t have any to boast of yet. Check out this website from Portland for a better, more detailed explanation of what sharrows are, exactly. According to cycling committee member Martin Koob, when the idea of sharrows was first presented to the committee, there was a lot of back and forth. â€œ[With sharrows] there’s still some indication that bikes are supposed to be there, but we need to make sure councillors don’t pounce on this instead of bike lanes,â€ he warned. Some cyclists really dig the idea of sharrows; others warn that we should proceed with caution. The Transportation Association of Canada expects to complete guidelines and recommendations on the design and application of pavement markings for bicycle traffic on Canadian roads in November, and sharrows will no doubt be included. What do you think? 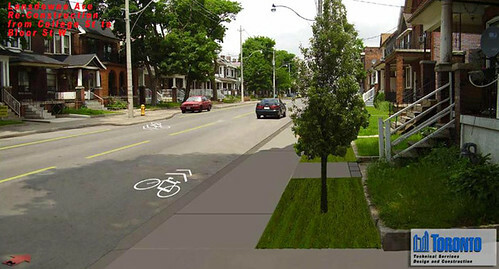 Are you looking forward to seeing sharrows make their Toronto debut?